If one participates in User Testing, do you declare that as well? And what about pet sitting services in your free time? If you use a platform like Pawshake or catinaflat, how do you declare this income? Hey Victoria. I can’t be sure here but if you do this on a regular basis, you ought to be registered as a freelancer don’t you think? Hi Bastien, I have been living in Germany since 2016. I was a student in 2017 without US or German taxable income, so I did not file a return for either country in 2017. In February 2018, I received employment with a German company that has withheld all German-relevant taxes. I also worked for a contractor located in the USA during 2018 resulting in 1099-MISC income exceeding the non-taxable threshhold. I know that I must complete a federal US tax return and will claim the “foreign earned income exclusion” for the wages received from my German employer. I have used both H&R Block and Turbo Tax to generate my tax return information: H&R Block was a little unclear on whether the 1099-MISC income could be included as “foreign earned,” but Turbo Tax was more clear in that it defined “foreign earned income” as any income that was earned by a tax person while in a foreign country (which would apply to my situation) despite the location of the employer. I will need to complete the German tax documentation in English and plan to utilize SteuerGo for this, but I wanted to check to see if you beleive that my decision to include the 1099-MISC as “foreign earned” on my US return is okay, or if on the other hand, you think it would be better for me to exclude the 1099-MISC income from the “foreign earned income exclusion” on my US return, pay taxes on that income in the US at US tax rates, and then claim the taxes paid in the US on the 1099-MISC income as a credit on my German tax return based on the US-German Tax Treaty. If I do pay the taxes in the US as opposed to Germany, will this likely save me some money, or does this scheme unecessarily complicate my German tax return? Hey Jason. Sorry, this is way out of my league. You should get in touch with a pro. Hello, I worked as a work-student in GERMANY ( year 2017 and 2018). I submitted tax return form, and I got the tax return only for the year of 2018. I thought that I will get for the year of 2017 and 2018 both. Now is it possible to apply for 2017 ?As I receive tax return only for the year 2018. It is this time of the year and, like always, I have been trying to delay it but it’s time to do my taxes. These days are always are dark and full of terror for me. I am in a bit of a pickle and thought that maybe somebody here could help me out a bit. So last year was my first year in Germany. From January 2018 till October 2018 I was employed by a bilingual nursery where I had a contract and worked part-time (25h) …to make ends meet and make a bit more money I also worked as an English teacher on a freelance basis and made less than 450€ extra a month. I don’t think I made more than 1500€ in total. This is all making my head spin now as I don’t know if I can use just ELSTER to report all my incomes. If yes, should I use one form or two different forms (one for my contracted work and the other one for my freelance stuff)? Or perhaps I should use another platform apart from Elster? I would love to employ a tax adviser but I feel I’m not earning enough to afford one. Thank you in advance and I wish you a lovely day! Hey Alexandra. I’d advise you to go with one of the self-help platforms then. You will need to fill a few more forms out. You need to make sure to declare any and all of them. Thank you very much for the time you are dedicating to this topic. I have a question as well. in 2018 i worked in Italy from January to September then i moved to Germany where i have been working since October 2018. I will file my tax return in Italy for the first 9 months of 2018, could i declare the last 3 months here in Germany without mentioning the Italian salary of 2018 since for that period i will be paying taxes in Italy? Hey Marco. Have you had a look at this post to avoid double taxation? Hi. I am working in metall firma from 3years and now my treatment is running on because I got accident in company while working period in company and doctor has done operation of my hand and put metall in my bones due to os fracture and doctor has told me to leave this work .so,I was thinking to go back to my own county .please help me how to take my 3years tax and insurance money back? Hey Suraj. I think you want to have a look this post. I run a small business in UK, we need to do VAT return in Germany since we use Germany local warehouse to send out orders. Here we come accross a problem while applying for an Elster account. The activation code post never arrived..We contact Elster, they say the activation code post will ONLY be sent to our UK address, not even an authorized representative in Germany, and they also refused to fax this activation code letter to us.. Anyone has any idea? I just filed by tax return for 2018 using Elster. My question is when we use Elster , the data is automatically sent to the Finanzamt correct? I don’t need to take a print out and sign anything to the Finanzamt correct ? Thank you for all the info! I am an American citizen working in Germany. I never made income in the US (I was a dependent of my parents), so I never needed to file a tax return there. My first (and current) job in Germany was starting in 2018. From what it seems like in your post, I don’t actually have to file a tax return in Germany. What do I do regarding this US tax return? Do I need to file a tax return in Germany for me to file a tax return in the US proving that I made no income in the US but made this income in Germany? I’m finding confusing information online, and I’m not sure what to do. I would appreciate any help you could give! Hey Gigi. Americans are the subject to an unfortunate exception. I’m not very knowledgeable on the matter so i would just advise you to search what your local embassy says. Hi Bastein…Can you provide the link to Anlage AUS – Ausländische Einkünfte here again. I seem to have some problem and the link is not opening. Hey Rounak. You can find that on the official website listed in the post too. I was working for a German employer for a year until January 2019 on Blue Card and submitted my tax declaration through https://www.germantaxes.de/ and received the confirmation that the application is submitted to Finanzamt. It’s been more than 2 months and haven’t received my refund yet. There is no support option on the https://www.germantaxes.de/ website. I’ve left the country already the day after I quit the Job in January. How do I contact or check my application status. Please let me know. Hey there. This website is operated by Wundertax: get in touch with them. Thank you for this wonderful post. I have the following situation if you could help. I was a student last year and did my internship from April-July and I was paid 4*1500 during that period, my company deducted the taxes from my income. Then I finished my study and started a full-time job from August. So from August onwards I paid 5*502 euro as taxes. Now I’m not sure how I’ll submit my tax return after working under two different employers and receiving uneven salaries. Do I need to fill two Anlage N 2018? Or you would recommend a Steurberater? My tax class is 1, single, no child if that helps. Thank you. Hey Zaman. Yes, two Anlage N would be the way. and use your Lohnsteuerbescheinigung from each of your employer for each of them. I have a question regarding pension payments. I am employee and as such pay compulsory pension payments (deducted from salary) e.g. lines 22 and 23. However, I also pay into a private pension with a third-party (Allianz), do I need to include these payments in my tax-return and if so, where do I include these details? Many thanks for the great guide! Hey Nathan. If i am correct, that would belong to the Anlage Vorsorgeaufwand Anlage, line 46 to 50. Hi, for a foreign student in Germany, if in a year 5 months I have done my thesis (Master Arbeit) which was a mandatory part of my studies and was done in a company. For this work, the company paid me 800 euro per month salary which was tax-free and I got exactly 800 without any deduction. This was done after they submitted a document from my university to finanzamt and they didn’t take any tax from this salary. Later in that year, I graduated and joined a company on a full-time job and paid taxes. Now I wonder that 5 months salary 800×5 = 4000EUR will this be included on my gross income while calculating whole year taxable income? or this Master thesis income is not part of this gross income? Because I did not pay any tax on this amount, but I wonder while calculating my gross annual income will this be added and affect my overall tax return? Hey Suri. Not sure about this one. I tried to do some research but couldn’t find anything conclusive. I would tend to agree with you: even though not income tax is applied on this amount, it would contribute to raise your total taxable income, and possibly increase the tax rate, depending on which tax brackets/threshold you are crossing. the new Steurnummer for me, and I am simply not aware (or well informed) of it? Hey Vlad. If you are moving places within Berlin, you won’t be changing Steuernummer. As for the other very long question: please reach out to a pro if you are unsure. There are so many parameters: i can answer within a comments’ section. I’m sorry in advance for adding to all the questions you’re receiving! I moved here in July 2018, therefore I was employed in my home country before I moved. You say in your post that SmartSteuer supports having a foreign employer that year, however I’m not 100% sure what you mean by that. I think that means you’re referring to Anlage N-AUS and not my scenario, which requires Anlage WA EST? In which case, SmartSteuer does not support that? Thanks so much! Hey Jaedyn. I was referring to N-Aus indeed. -is there fixed month of the year to file tax return (ex.July) or it can happen throughout the year (Jan-July) but with 31 July is deadline ? return? Will it be full refund of income tax or partial? Hey Laura. Please read the post again. Deadline is clearly indicated for both employees and freelancers. Holiday expenses do not offer a tax rebatethough. Thanks a lot for all these informations, one more time ! Another special case : my boyfriend and I worked last year in Berlin, but now have left the country. Is there a way to do everything by internet only, without needing to send it by post, or receiving a password by post? And in this case, which address should we give? The one we had, and a foreign current one? Thanks a lot for your answer and time! Hey Eloise. If you can’t access to Elster from where you are, you could use of those platforms indicated in the post. I know: it’s not for free, that’s not ideal. But yes, you can do it through Internet. Amazing work you’ve done here! Thanks so much. My boss terminated my contract and will end on March 31, 2019. How do I proceed with taxes during the month of april and following? I will be a freelancer (sales) for a foreign company, receiving gross income and should declare taxes myself (easy website/english maybe? :) Also pay my krankenkasse myself. What order of things would you do in my case? Should I notify some institution with this kündigung? I won’t have any income in april so i really want to avoid expensive taxes!! Hey Santiago. Have you looked at this post for newly self-employed people in Germany. It has a bunch of information about this too. I think you would probably find the answers there. I was working for an indian based IT company, where the company took care of Tax returns. I used to give a vollmacht to my company and do the tax returns and declarations with help of external tax agents. I got a new job offer and switched to a germany company from March 2018. But I was working in Indian IT company till end of Feb2018. I did gave my company vollmacht for year 2018. But I have tax return due to change in tax class after March 2018. My question is : can the tax return be filed by my company and me for the same year 2018? Hey Palani. Why not revoking that Vollmacht and take care of it all by yourself? Great article! I have a special case, I was student (I’ve studied with a scholarship) until september 2018 and then I got a job. I received a so called “Lohnsteuerbescheinigung” from my job and also I received from my insurance company a so called “Finanzamtbescheinigung” which described the amounts I paid to them when I was student (from january to september), then my question is where should I that information in my declaration? Hey Carlos. Refer to the guide in the post for more details. My tax class is 1 and I started my first job in March 2014, I paid the tax for the whole year. Can is till file for 2014? Also in 2015 I didn’t work for the month of May. Can i file tax return for these two years? My co-workers told me that we can file it last 5 years. Can you please tell me deadline and how to file the tax return? Hey Jyotika. As mentioned in the post, it’s up to 4 years after the end of the year. So 2014 won’t work but 2015 will. Deadline remains the same. As for how: refer to the post. Hello, I just registered for Elster (I’m a freelancer, not self-employed) and didn’t realize you have to get the code by post. It’s almost impossible to get mail at my address because of the stringent co-op board’s regulations on signs on the postboxes (long story). So, I have an accountant: is it possible to register using my accountant’s address? Or to register a business address? I’m not sure how to proceed if I cannot register with this system. Can I just file on paper instead? Hey Jennifer. That is a good question. I think it will be sent to wherever your company/self-employment is registered. Hello! Thanks for your help. I am a German resident and I am employed with an EU blue card. I do have a small income in American stocks, but all of my main income comes from my salary. The capital gain that I earn in foreign income (from my stocks) is less than €200. I was told that if the amount of foreign income is this small, I am not required to file it in german taxes. Is this true? Hey Sherry. It doesn’t matter what the amount this. As a German resident, you ought to declare all income sources. Hey Rovshan. If you are not a German resident, you should be declaring your income in your home country. I am a foreign master student in Bayern, currently in the 5th semester. I am stuck in a situation and I do not know what to do. I received a letter from my insurance company (AOK) stating basically how much I paid for the health insurance in 2018. They clarified that I can use this information for the tax return, if I have to do it. Up to that point I had no idea such thing existed in Germany, also in my country we do not do it so I might be misinformed. It was the first time I receive such letter from AOK. Furthermore, I have not received any letter from the corresponding financial offices saying that I should do it (I do not know if I should even receive one). -From January to April I used to work in a restaurant as a mini-job (less than 450euros per month). I did not pay taxes for that since it was a mini-job. -In May-June I did an internship in a company. The internship was counted as a research internship required from the university. I got paid around 10 euros per hour. And I did pay taxes. -From October to December I am doing my master thesis at a company. I get paid a little more than the internship and I pay taxes. And the thesis is still going. The current contract I have runs until May. Honestly, I am getting a little scared as I have zero experience in such things, my income situation is also complicated as I explained above and my lack of German knowledge is a huge problem. And searching on Google did not take me anywhere, it just rose more questions. Could you help me in whether I have to do the tax return or not, considering my situation? Should one receive a letter saying that I have to the tax return? Where can I ask to receive a final confirmation if I have to do it? And is there an office related to the tax return where I can go and clarify all this on my own or so? Thank you very much in advance for any help you will provide. Hello Eriserdi. German can be overwhelming at times. As stated in the post, you are not required to do one. You won’t receive a letter from the Finanzamt. Thanks for such a beautiful well written explanation on this topic. I have one query though. I started my work in Germany in September 2016. Can I file tax return for the year 2016 as well? Or is there a “minimum number of months” requirement? Hey Arunika. You can file a tax return for the year 2016 as well yes. Anlage Vorsorgeaufwand 2018 (The form to detail your insurances) ??? And where exactly do I need to send the documents? Hey Ivan. Yes, that’s correct. You need to send your documents to your local Finanzamt, as mentioned in the post. Hey Sam. Since you are applying for a tax change before November, you can benefit from tax benefits for the months prior too. Hard to say whether or not you need an accountant. It’s mostly down to if you have multiple sources of income and the amount of potential tax relief schemes you can take advantage of. If you have both only source of income, it’s totally manageable via SteuerGo. Thank you very much for your article. Small question: My employer mentioned my tax class wrongly as 6 instead of 1 for year 2018. I got the lohnsteurbeschenigung for 2018 under tax class 6. I noticed this in 2019. Can I do retroactive change for 2018? If so, could you please guide me on how to file one? Any online support or I have to approach finanzamt? Hey Krishna. There is dedicated post about this topic this way. It should help. I work as a resident doctor in a hospital from 15/12/2017 until today and i want to make my first ‘Steuererklärung’. My questions are, should i ask for tax return for the 15 days in December or ignore them, i mean does it make any noticeable difference in money return since they are only 15 days in 2017 ! second question is: can i get a back some of the money i spent in Germany before i start my first work, i mean like Exams, Language Courses and Aufenthalt fees. Since the courses and exams fees were necessary to get the Work License. Hey Peter. You can also do one for those 15 days too, provided your got a Lohnsteuerbescheinigung for that time period. You may also put any costs towards your education off in taxes. Thanks a lot for your valuable information in this website. I ‘m working in Germany from Nov. 2016 up to now as a forigner. I have a short term work permit as Blue Card which is valid until Nov. 2019 (I’m not a permanent residence of Germany) .I’ve deceided to quit my job in Germany by Jun 2019 and move to canada for living. I have also a type of 13 TVöD contract. Do you think can I return a part of my tax payment? Thanks in advance! Hey Jeen. Sorry i don’t think i can help on the specifics of your case. I don’t know about 13 TVöD contracts. 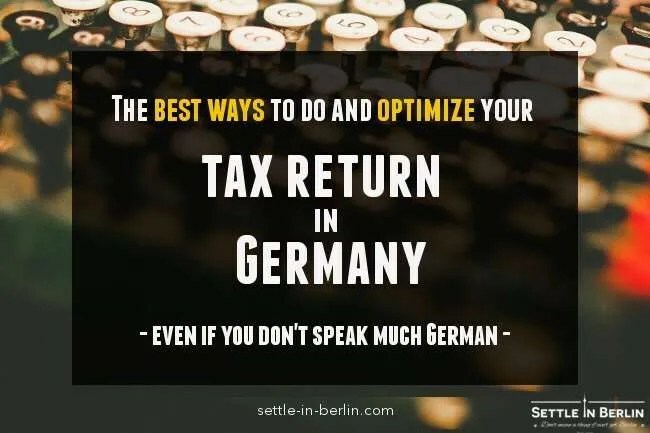 However, since you have been here since 2016, you’d be considered a German resident and therefore you can do a tax return for 2019 too, since you will be more than half of the year here. Thank you for all this helpful information. I moved to Berlin on a freelance artist visa in the middle of last year and received my anmeldung (with Steueridentifikationsnummer) in August. I only received my Steuernummer in December. Do I still do taxes from August, as I had started doing small jobs already? Can I expect by end of March..? Hey Ravi. See the FAQ for an answer. I am living AND working n Munich since January of 2018 and currently doing so having the steurklass 5. From October my wife came, we got married in November, I then kept working having changed from steur 5 to steur 3 since then. She has now a mino job. Since I dont have any other income besides my job should I so the tax declaration? If so, what kind of expenses should I declare? Hey Rodrigo. Yes, as mentioned in the post. You should do it. Regarding rent, as I its my first year I am paying directly to my landlord without receiving any kind of receipt or proof og payment. Is this declared ? I mean, I can do my tax declaration without the renting part? Hey Rodrigo. Yes, rent expenses are not relevant. Thank you for you answers. Hope they help someone else! I worked in Germany for 5 months with special assignment. I came on deputation from Indian company to here. I went back after 5 months and continued my job in my origin company for rest of the year. Am I eligible to apply for tax return? Hey Girisha. If you are an Indian resident, working under India contract for an indian company, i don’t think that would be possible. Last year I submitted in my tax return through a steuar berater which was estimated to be over 1800€ but finasamt later informed me that I will get less than that amount because am not paying for my child internal, as I am staying together with my girlfriend but I had just join her in about 3 months. Was this really necessary? Hey Fauza, I don’T really understand the question. Thank you for the info. Can you please let know as to what are all the bills that can be submitted for filing tax return? Ex: Electricity bill, grocery bill, etc. Hey i need to know how can i file a tax return without having registered address (Anmeldung). Actually i am running out of time and i cannot do my Anmeldung in such a short period. is there a way out of this because in all the forms, you have to mention the registered address. Hey Ali. If you are not a German resident, you would do your tax return in your home country. Hi, great article and still i have 1 question : Is the fuel spent for travelling to work refundable, do i have to keep bills or something etc? i arrived in Germany on the 24.12.2017 and they are telling me to pay the tax for the whole year 2017. I come from Mauritius and have worked there and paid my taxes there. Is it true that I have to do this, please? Hey Anique. What sort of tax are you talking about now? Hey Rehan. This seems weird indeed, does this mean you haven’t paid any Lohnsteuer all year then? My husband worked in Germany for 2 months in 2017 (Nov, Dec) and 1 month in 2018 (January). Can he claim for tax return? Hey Afreen. This question is too vague. Can’t answer sorry. I couldn’t get the following: if one has been employed by different employers within the same year, is mandatory for him/her to fill the declaration? Or is it just his/her right to do it? Hey Hephep. As mentioned in the post, it’s one of the cases in which you are obliged to do so. I completed a tax return for last year and got a lot of money back as i’d only worked for half the yaer. My question is, do I HAVE to, by law, do one again this year for 2018? I’ve heard that ‘once you do one, you have to do it annually’ but that doesn’t seem all that real to me. Also, what are the implications for not filing a tax return? Hey Katrina. It is written in the post who do a Steuererklärung. We have landed in Germany in Dec 2017. Only my husband is working and I have two kids. The problem I have is, due to technical issues(the registered officer for us was on long leave) in stadhaus, we had our blue card printed delayed by 6 months. But my 2nd boy still didn get one though, coz unfortunately his passport was about to expire nd our officer said he will give 9 months temporary visa. So they are waiting for that time period to get over for blue card. And the trouble here is, i did not get kindergeld for 6 months for 1st boy and am not getting kindergeld for 2nd boy yet(14 months now) . Will I be able to claim for it in tax return? When I went to familienkasse office, they are not helping with English. Hey Adisfah. You may want to double check with a professional but i don’t think you will be able to proceed that way. I think you will need to take this with your Familienkasse directly. Hi Bastien, For 8 month I received unemployment money and only the last 2 month of 2018, I had an internship job with tax class 5. The amount of unemployment money was sth like 5900 Euro which was given in Hauptvordruck in line 96. But surprisingly from ELSTER, I got the Berechnung saying ‘ Festgesetzt werden as +2350 ‘ Euro which makes a total estimate of +90 Euro to be paid by me to financeamt. Should I go their office and talk? or this is just an estimate that Elster gives and probably some how they will understand that my unemployment money was already reduced to my tax class 5. I am having a bad economic year and was really counting on this tax return. I never got less than 300 euros back and now this is really surprising for me.Thanks! Hey Iman. Unfortunately, i cannot tell you if that’s right or wrong because there are many other parameters involved into deciding what is due. If you think that is a mistake, you can go a Verband or a Steuerberater for more help. Sorry and good luck. Hello! Great information here! However, the tax deadline has been changed for the first time this year. The tax declaration for 2018 can be filed until July 31st, 2019! My tax class is 1 and I started to work in December. When I check my payroll, the tax is considered for the whole year. Since I worked only one month in 2018, am I granted to take any tax return? If so, can you tell me what percentage it will be? I also have another question regarding my marital status. My wife is in my hometown and will join me 4 months I started to work ( in April, 2019) . When I change my tax class from one to 3, can I take any tax return for January, February and March in 2019? Hey Mike. Yes, you can do a tax return even if you only worked one month. For second question, please read this article. the deadline to submit your tax declaration has been changed this year! So for the tax year 2018, the deadline is July 31st, 2019. If you could update your information on this, it would probably be helpful to many people. Other than that, this is a great guide! Thank you very much! Hey Désirée. That is a great reminder. I forgot to update. Thanks so much!